I’m a photographer, mini-filmmaker, speaker, surfer, skater, and soon to be author … I’m now in my second decade (gulp!) of #Being-PALL #PlasticALotLess both living and inspiring preventing plastic pollution at source since 2008, long before it was trendy! 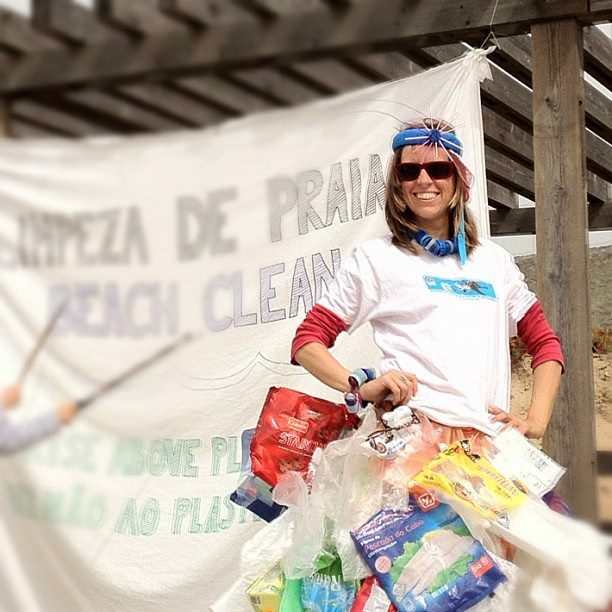 I learnt about Plastic Pollution during a beach clean when I lived in Portugal. (full story below) I started refusing sinlge-use plastic the next day. Although I continued to arrange dozens of cleans, I learnt from them and looking around – the only way to stop plastic washing up is to prevent it – at source. And that is what I’ve been doing ever since … Why the term #BeingPALL? Plastic-Free has never resonated with me, because, well I’m not! I write on my plastic computer, all be it a second hand. I refuse single use plastic every day, in the first three years I’d refused over 10,000 plastic items, I’ve continued for a decade, but plastic-free? No. How in this day and age can we be? By living in a cave with no wi-fi?! I’m not prepared to do that (not yet anyway!). Plastic-Free feels like a well meaning diet. It all goes very well at first, then becomes overwhelming and before you know it, you’re back on the (plastic wrapped) pies! #BeingPALL is sustainable, guilt free and a work in progress. In 2015 I moved to Bristol, my aim being to prevent plastic pollution at source full time. In January 2016 Natalie Fee invited me to be Creative Director at the now, multi-award winning City to Sea. So I’ve been a bit quiet over here, but we’re busy over there! I’ve made videos that have gone viral and images I’ve taken have been used in many press articles to highlight our campaigns, I’ve gone from never speaking in public to a confident speaker with reviews that have surprised me! Hosting events and award winning films, sitting on a toilet with my knickers around my ankles in public, being a Mermaid with a Message – to name a few! Before 2008 I was pretty ‘normal’ in the plastic side of things. I bought a lot of plastics. Water in plastic, lazy soups, filled pasta, microwave meals for work, bags upon bags under the sink, bathroom full of plastics, drinking straws. I used plastic cups and plates when ever they were given to me. You know, the usual story. I recycled, before it was as common as it is now. One day a few of us went to a deserted beach, close to where I was living on the West Coast of Portugal. There was a you tube link to; A Tale of Entanglement. Which is a pretty graphic film of animals entangled in plastic. I was upset and looked around the camper… at all our plastics. The next day I started refusing and researching. As a photographer and surfer. I started shooting surfschools. This meant I was spending a lot of time on the beaches. Little peelers. My kinda wave! With the Atlantic swell, it´s hard not to notice the ever-changing plastic washing up on the beaches. Especially when I was shooting, over the many years that followed, even in Summer swells plastic washed up around my feet every day. I was constantly reminded of the presence of plastic pollution, so I couldn´t help but do something positive about it. Firstly be reducing my own plastic drastically, and then helping others reduce theirs. Although I´m still come up upon obstacles, I try my best to over come the challenges as refusing plastics is a way of life for me now. I don´t claim to be perfect, there´s always more anyone can do, but PALL-ing´s a good place to start. I hope this blog can help you to PALL – Plastic A Lot Less – your lifestyle. Please get in touch, especially if I´ve helped you out, I´d love to hear from you! Wondering why it took Six years Being PALL before blogging? Read my first post here. Proud moment. Featuring in the new edition of Beth Terrry´s How I Kicked the Plastic Habit and how You Can Too. Brilliant blog I am going to follow you & get all your tips. I have been trying to minimise plastic useage for about 10 years, but often find myself lapsing. I was planning to have a go this holidays – to try to go for a whole week (!) without buying anything in plastic, just to see how it would affect my buying habits & with the aim (obvs) of learning from it. Hi Kate! Thanks for getting in touch. That´s fantastic. It´s easy to lapse when you´ve been doing it so long! That´s what Plastic Free July is about. To see how it goes. They they say it´s free on single use plastics, not all. There are lots of tips around my blog that will hopefully help you. Let me know how you get on. Good luck! An excellent blog. You are a true pioneer, and an example to those of us who should know better. Since reading your blog I have been deliberately trying to cut down on plastic use, and been more aware of just how much there is in everything. I don’t think I will ever reach your high standards, but will aim higher with mine. Thank you. That´s great to hear that you´re trying to cut down on single use plastic since reading my blog! I found that, once I became aware of it I noticed it on everything… I have been doing it over 6 years don´t forget, and I´m not perfect! We can always aim higher… PFJ pointed that out to me too. Saw you speak last week in Bristol and absolutely loved your passion and drive. You’re were so inspirational and practical. I’ve started pestering my local pubs about straws – fingers crossed! Hi, thank you for sending me a message and for your kind words. I really appreciate it. That’s great!! Let me know how you get on with them. Not sure which session you were at last Saturday? But there were a few people wanting to get on straws, be good to all work on them together. Good luck! Thank you Plastic Free Deli! Good to hear from you. It is hard… slowly slowly, PALL is a good place to start.